As a Curator, I am often asked “What’s your favourite object?”. Now to me this is a difficult question to answer – it’s a bit like being asked “who’s your favourite child?”. There are so many great objects in the collection that it’s impossible to pick one. Every now and again though you get a new donation, discover the story behind something in the collection, or re-discover a really interesting object, and this becomes the object of the moment. My current “object of the moment” is an advertising poster for an electric company which was transferred to The Workshops Rail Museum from the Queensland Energy Museum (QEM) in 2012. The poster is a beautiful example of a lithographic poster from the first half of the 20th century. Painted by Montague Birrell Black, its composition and colours really capture the eye and make it a great example of the approach of that time to promoting prosaic matters such as railway travel and electrical generation using aesthetic presentation. 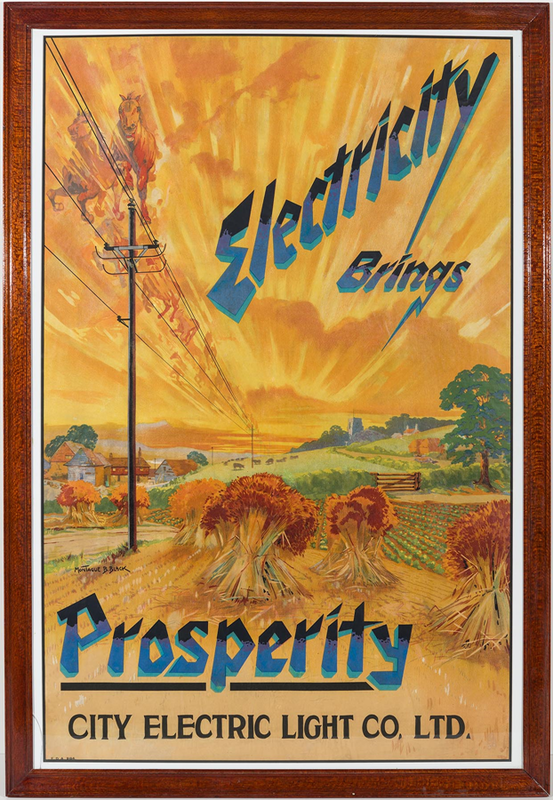 Electricity Brings Prosperity – advertising poster for the City Electric Light Company Limited, Lithograph by Montague Birrell Black. Montague Birrell Black was born in Stockwell in London, England in 1884. A renowned painter, illustrator and poster artist in the first half of the 20th century, he was active in poster art from 1910 until the 1950s. He was best known for creating advertising posters and panoramic landscape maps for transport – both railways and shipping lines. Using watercolour artwork as a basis for lithographs, he produced posters for shipping companies such as the White Star Line and French Line CGT, and major British railway companies London and North Western Railway (LNWR), London & North Eastern Railway (LNER), London, Midland & Scottish Railway (LMS), Southern Railways (SR) & British Railways. One of his most famous posters was produced in 1926 for the London Underground, where he depicted transport scenes of the 21st century which highlighted the benefits of the underground rail system. Black had a distinctive style which carried through a number of his works. The colours and style of his depictions of countryside, transport and landscapes for posters in Britain are also seen in the Electricity Brings Prosperity poster. While the focus of the poster, electrical generation, is a departure from his normal subject matter, the style is very much Blacks’ own. For me though, what I really like about this piece of artwork is the symbolism. It depicts an idyllic rural scene (ironically, or perhaps not unexpectedly, with British features of hay ricks and village churches rather than the landscape of the Australian bush) which is at odds with the metal, bricks and soot of electrical generation. The scene promotes ideas of prosperity and technological development in the agricultural economy of early 20th century Queensland. This matches the context and political ideals of this time in Queensland, where rhetoric around prosperity, innovation and infrastructure development being the future abounded. The advent of electricity in Queensland from the earliest days of the 20th century and the relatively quick expansion of electrical generation across the state meant that promotion of electricity was an important undertaking. I also love the symbolism directly related to electrical power – the “lightning bolt” styling of the headline text and the “horsepower” running through the lines – representing a wonderful artistic depiction of the new energy. So while I could never have a “favourite”, every now and then an object like this poster really speaks out and makes my job a fascinating privilege.